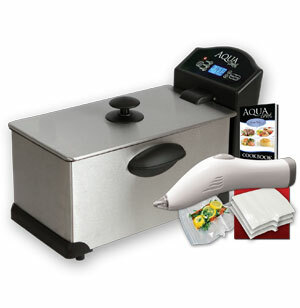 The AquaChef uses the sous-vide method of cooking; the same precise cooking method used by gourmet restaurants around the world. Food is vacuum sealed and heated in a water bath - preset to an exact finished temperature - making it virtually impossible to over- or under-cook your meals! It's the easy way to get "precisely cooked" beef, roasts, steaks, ribs, fish, seafood, pork, vegetables, desserts and more! Foods are perfectly cooked "and then held" at the same precise temperature - staying perfect, moist and tender - until you're ready to serve. Precise Temperature Control makes it so your food will never overcook. Food Cooks in a Water Bath via BPA-free and Temperature-Safe Bags. Locks in 100% of your food's Flavors, Moisture, & Nutrients. Vacuum sealer, 3 reusable BPA-free vacuum seal bags and cookbook included. Great for Hunters, Fishermen, & Outdoorsmen! Perfect for RVs, Boats, and Home Use!